What a strange feeling to come across grandpa’s pipe right when my only son was getting married. Lifeblood can speak to us in unpredictable ways. It is almost morbid how old experiences repeat themselves, and the person to whom you wish you could say “You were right the whole time,” is no longer here to see that you finally got the message. “You must learn how to control the knights. They’re unpredictable. They move in a L-pattern, and in a matter of seconds you may either surprise your opponent or be surprised by him. You have to control the knights,” my grandpa used to say. He preferred to play with the black pieces. At that point in life, he had learned to control his black knights, but that hadn't always been the case. My grandpa was one of those guys who screwed up, and screwed up big time. For a long time he had tried to take advantage of life to its fullest. Going with the flow wasn't enough for him. He wanted to sail new oceans, to explore uncharted seas, and voraciously devour every second that counted. However, this comes with a price, and usually very high. He read philosophy and wrote treaties. He studied the arts, and painted canvases. He took part in revolutions. Wherever tyranny and barbarism would threaten man’s spirit and freedom, my grandfather would be there, armed to the teeth not only with weapons, but with ideas to defend his beliefs. He traveled the world, and loved many women. My father also loved to hear his stories, but he knew how hard and dangerous it was to have a heart like his… blazing inside, all the time. Learning how to control the knights was imperative. “I’m coming, woman,” he screamed from the garage, holding his grandpa’s pipe. It was a cold day and starting to drizzle. “One must learn how to control the knights”, he repeats staring at the dark grey sky, as if someone hidden in the clouds were listening. I was probably twelve then, and I felt insulted when someone referred to me as a child. I had already smoked and I tried to behave like a man, therefore I expected to be treated like a grown up. “Once and for all, Dad, why doesn't my mother talk to Grandpa?” I asked my father later that night, while we had some milk in the kitchen. Mom was at her Philosophy course in college. She was finishing her third college degree. She spent most of the time reading the books, and although they had never discussed it, it was the same stuff my grandpa used to talk to me about. “Well, okay! Since you’re so adamant about it, here it goes… It’s nothing like from outer space. One day, when your mother was a little girl, about ten years old, I guess, your grandpa grabbed his things, jumped on a horse, and left the home to chase after a skirt. He left you grandma, your mother and her siblings without two pennies to rub together. Since your mother was the eldest, she had to drop out of school and start cleaning Aunt Alice’s house, to bring home some money. Five years later, he came back with his tail between his legs, totally ashamed, and your grandma took him in. She, your uncles and your aunts forgave him. Your mother didn't. From the day he left home until now, they haven’t spoke – not a single word. The year was nineteen eighty, and I played in a punk band when I went to see him in the hospital. Grandpa was dying. Pulmonary emphysema. He’d smoked too much, for too long. He was fairly old and hunched over. I guess he must have shrunk about four inches in the last ten years, while I was growing like a mating giraffe – a teenager in contrast with a grandpa. When I arrived he was asleep. He had a hook-like plastic tube hanging from his mouth, and catheters inserted in his arms. God had caught him. That was no a fancy hook in his mouth, or one for such a special fish. I leaned against the bed, held his hand and stroked the back of it with my thumb. Even the hair on his fingers had turned gray. He opened his eyes sleepily. It seems as though his eyelids weighted a ton. They yearned to be shut for good, but he was a tough guy… every wrinkle in his face represented a collection of successes and failures. He was a regular guy, but any woman with the slightest soul would have wanted to kiss his mouth right there. That was no old man lying in front of me. It was the mystery of life, with all its sadness and joy bundled together. I was one of those guys who had experienced a long and rebellious teenage life, probably inherited from my grandpa. Just recently, I had grown apart from the entire family, even from him. We make so many mistakes in this life. I stroked the sparse hair on his head. When I left the hospital that day, his eyes followed me. I looked back four or five times, and he was still staring through the glass door. It wasn't so much that he was looking at me go, as he was hoping someone else would arrive. But that someone never came to see him, and he died before he saw another day. Some men become huge in death. It’s more important to be man enough to die than to live. A crowd attended his funeral. It was full with people telling histories about my grandfather. Indeed, he’d had many experiences. My mother was there. She didn't let anyone near her, not even my dad. She squatted down in a corner, heavy tears streaking down her face. She remained absolutely silent. When the coffin was lowered, she drew near and threw a handful of dirt. I think she must have aged about fifteen years that day… maybe even more. Her hair went from black to all gray during the funeral, and her wrinkles became more pronounced around her lips. I was sad to see her suffering like that. I reached to hug her, but she repelled me. She wanted to be alone, like a patient clinging to life-sucking cancer. The man fondled the pipe he was holding, like a boy caressing his doggie friend. As he puts the pipe into his sweater pocket, he made a mental note to stop by a tobacco shop on the way home from the party to buy tobacco. He also wanted to buy one chessboard, because this was his son’s wedding day, and his grandchildren will soon be arriving. Nothing new under the sun. Life repeats itself. Knights have to be controlled. Horses have to be tamed… Far away from there, in the stables of the farms that circled the city, the horses were growing skittish... they were all sorts… golden bays… black ones… white ones… pintos… running in the sprinkling rain towards the sun setting. Here in the city, Ariel walked to the bathroom totally oblivious of all this, but he felt a stir on his chest. “You were right the whole time!” he repeated quietly, patting his hair, wet with rain. Life goes on. 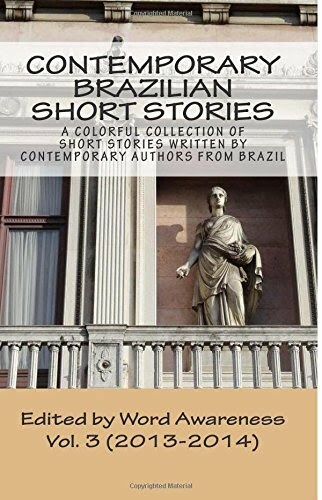 DANIEL LOPES’ works have been published in several literary magazines, including Amálgama, Germina, Escritoras Suicidas and Cronópios. His novel, É preciso ter um caos dentro de si para criar uma estrela que dança [You Have to Have a Chaos Inside of You to Create a Star That Dances] was published in 2008, and his book of short stories Pianista boxeador [The Boxer Pianist] was published in 2010. That same year, he received a Valeu Professor 2010 [Thanks Teacher 2010] award in the Short Story Category.